REUNITED….AND IT FEELS SO GOOD! Rip Hawk and Johnny Weaver. Two all-time professional wrestling legends. And two names that are synonymous with pro wrestling in the late 1960s and early 1970s in the Carolinas and Virginia, the time frame that I first started watching All-Star Wrestling put on by Jim Crockett Promotions. While both Rip and Johnny held significant singles titles in their storied careers on the mats, they are best remembered by most for their rivalry as part of a long running tag team feud for the ages in the 60s and early 70s. Rip Hawk and Swede Hanson versus George Becker and Johnny Weaver…little more need be said for us fans who remember back to those days. Those four battled over the Atlantic Coast Tag Team Titles for many years, and no matter which team held the belts at any given time, the fans were always treated to a memorable match when those four hooked up. For myself, Johnny and Rip always stood out on their respective teams. They worked so well together, and meshed perfectly in the ring. And as such, they combined to form my earliest and most enduring memories of professional wrestling. As the early 70s moved toward the mid 70s, and “All-Star Wrestling” became “Mid-Atlantic Championship Wrestling,” Jim Crockett Promotions was changing significantly in many ways. New and different talent was brought in and pushed, and the tag team emphasis that defined Crockett Promotions for so many years would rather abruptly end. It’s hard to argue with the long-term result under new booker George Scott…Mid-Atlantic Championship Wrestling would become perhaps the hottest territory in the country under his direction. But the downside of that change for many was the de-emphasis of some of Crockett’s biggest attractions of the past---most notably Rip Hawk and Johnny Weaver. Rip left Jim Crockett Promotions for good at the end of 1974. Johnny left roughly at the same time, but his absence was only for about nine months during 1975. 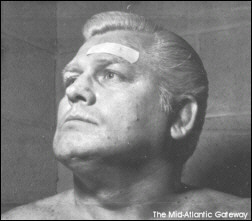 When Johnny returned, Mid-Atlantic fans were fortunate to continue to see him wrestle in our area for another ten years, though never again with the same frequency and top billing that was always seen during his days in the ring with Rip. In some of those later years, Johnny even wrestled with and against Rip’s old partner Swede Hanson. And when Johnny still later became a television commentator, it was always a treat to hear him talk about Swede or some of his other rivals from earlier years, such as Brute Bernard. But with Rip no longer in the territory, those matches never seemed quite the same. 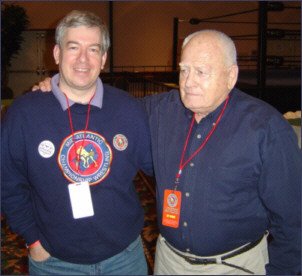 One of the great thrills for me in all of my years as a wrestling fan, was having the privilege of interviewing Rip Hawk for the Mid-Atlantic Gateway earlier this year. After only a couple of minutes on the phone with Rip, it was clear to me why he was such a favorite of mine all those many years ago. And someone I would always defend to my friends back in the day, despite the fact that Rip the rulebreaker was routinely getting the best of such fan favorites as Jerry Brisco, Thunderbolt Patterson, Paul Jones and Nelson Royal. At the time of my interview with Rip, the second Mid-Atlantic Wrestling Legends Fanfest was being planned for Charlotte in November. I talked to Rip about the first Fanfest back in January, and told him that I thought it was an amazing event. I also told Rip that it would have been even better if he had been there, and to consider coming to the next one and that I would be happy to put him in contact with Greg Price to try and make his appearance in Charlotte in November a reality. To my delight, Rip seemed very interested in making the long trip from his home in west Texas to Charlotte for the second Mid-Atlantic Fanfest. But he did express some reservations, mainly regarding whether there would be any wrestlers from “his day” that would be attending. 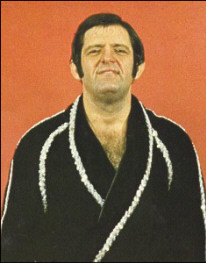 I assured Rip that Greg was intending to bring a number of stars in that he worked with in the 60s and early 70s, including Paul Jones, Jack and Jerry Brisco, Ivan Koloff, Ole Anderson…and of course, Rip’s number one rival Johnny Weaver. I told Rip that one of the biggest highlights for me at the January Fanfest, was finally getting to meet the “Dean of Wrestling,” Johnny Weaver. The mention of Weaver immediately brought a heightened tone to Rip’s voice! To my amazement, Rip told me he hadn’t seen Weaver in nearly 30 years! Can you imagine, these Jim Crockett Promotions mega-rivals hadn’t crossed paths since the mid 1970s? In that conversation, Rip mentioned several times how much he was looking forward to seeing Johnny. 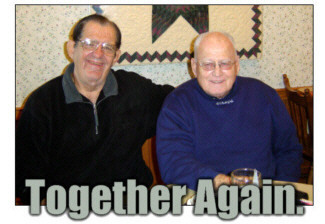 After hanging up the phone that night, I couldn’t stop thinking of how the reuniting of Rip Hawk and Johnny Weaver after all those years would be the highlight of November’s Fanfest. After getting Rip’s okay, the onus then fell on my tag team partner in this matchmaking endeavor, and my good friend, Peggy Lathan. Peggy made contact with Johnny, and through her efforts a breakfast meeting was set up with Rip and Johnny on Saturday morning of Fanfest weekend at a local Charlotte restaurant. When I drove Rip over to the restaurant on Saturday morning with Peggy and our friend Mike Cline, I had that same feeling of anticipation I used to get when I saw Rip and Johnny wrestle over 30 years ago. But on this occasion the anticipation was magnified about a thousand percent for me…these two were ACTUALLY going to be reunited after all this time!